Lewis Hamilton (1st, 1:35.658): "It's a great feeling to lock out the front row, particularly with the tough weekend we've been having. In the dry, I thought I would be lucky to get third, fourth or maybe even fifth, as Ferrari have been quicker than us and Red Bull were fast too. But then the heavens opened and I knew we were in the game. The rain levelled the playing field and gave us that opportunity to make the difference. I'm really proud of my team, they did a great job today and brought their A game. This has been a good track for me for years, but for some reason the last couple haven't had that extra sauce that helps me get ahead. If it's dry tomorrow, it's all about positioning, as it's so difficult to overtake here. It's a long run down to Turn 1 so we have got to try and make sure there's no space to get by." Valtteri Bottas (2nd, 1:35.918): "On the one hand, today has been somewhat disappointing, as I wanted to get pole. On the other hand, I'm really happy for the team, a front-row lockout is the perfect result for us. This result would have been really difficult in the dry; but the wet conditions gave us the opportunity to be better today than Ferrari and Red Bull. It's so tricky to get it right in the wet - it's not easy to stay on track, let alone to be on the limit, trying to squeeze everything out of the car. It's so tough if you know you only have one lap, but today everything just came together. The team did an exceptional job with the timing and the tyre choices. As a team, we absolutely nailed it today. We now need to decide on the race strategy; there's obviously two options for the start tyre - either the UltraSofts or the Softs. We will analyse the situation carefully and then make our choice. It's great to start from P1 and P2 at a track like this where it is so difficult to overtake. We will give it everything to keep the Ferrari behind us and I'll push hard to gain one position. It is going to be a good fight tomorrow." James Allison, Technical Director: "This weekend has not been easy at any stage, and this afternoon our entire team really earned their money, from the tyre handlers, to the pit stop crew, the race engineers, strategists and, above all, our two drivers. It was a very difficult session, with lightning flashing all around us and changing levels of water not just from run to run, or from session to session, but often during the laps themselves. We somehow contrived to always be on track with the right tyre, at the right time and when it came down to the final shootout, with one shot at getting it done, two brilliant laps from Lewis and Valtteri put us on the front row. We don't expect tomorrow to be any easier, but we can be very grateful that we didn't stumble when tested this afternoon." Toto Wolff: "That was such a tough qualifying, with a mix of UltraSoft, Intermediate and wet tyres at different points of the session - and the kind of day when it's easier to drop the ball than not. Ferrari looked a little bit better than us in the dry and on the intermediate tyre, perhaps we had a small advantage when it came to the extreme wet. But the difference today was made by the human factors, not the machines. Our team responded with calm focus to the ever-changing conditions, we saw the storms popping up and reacted in the right way, then it all came down to one lap on the wet tyres - and both Lewis and Valtteri nailed it. Congratulations to both of them on a faultless job. We have given ourselves the best starting position for tomorrow, now we need to turn that into a strong result." Max Verstappen (7th, 1:38.032): "My main issue today was a lack of grip, especially in Q3. The feeling on the Intermediate tyre wasn't that bad but when we put the Wets on it was really tricky. It seems at the moment that this year's car struggles a bit in the wet and we need to look into why it is different to last year's. We have already experienced that we struggle to get heat into the tyres and today that really showed. Usually I feel comfortable enough to lay down a lap in these conditions but I just was not able to today. I feel, due to the rain, we have missed an opportunity to have a really strong Qualifying so that is a bit frustrating. We weren't happy this morning in the dry but we made some setup changes that I think would have made it better for Qualifying, had it not rained. This gives me confidence tomorrow but starting from P7 here does not make it easy. I think it is supposed to be dry and really warm for the race. That said we didn't expect this today so let's wait and see what we get tomorrow." Daniel Ricciardo (12th, 1:36.442): "It just seems we were unlucky today. We had the Soft tyres we had to use and we thought they would have been safe enough for Q1. It made life difficult but it was good enough, just. Then obviously the rain came at the start of Q2 and the first car on track was getting a big advantage and the better conditions. In my first timed lap, the one that had to count in the end, I had Stroll spin in front of me so I had to abort and then it just got wetter and wetter and that was the only opportunity to make a good lap. The following laps it was too wet and in the last sector I was just trying to survive. We had to put the Wets on, but they were never going to be as quick as the Inters as the conditions of the track got much worse compared to the beginning. It was more bad luck than bad strategy though. Tomorrow obviously, I will try to move forward as fast as possible, I think we have the pace, but from 12th is a long way. I'll overtake, I'll find a way!" Christian Horner, Sporting Director: "A frustrating Qualifying for us today. The rain, which began before Qualifying and fluctuated throughout the sessions, created challenging conditions. 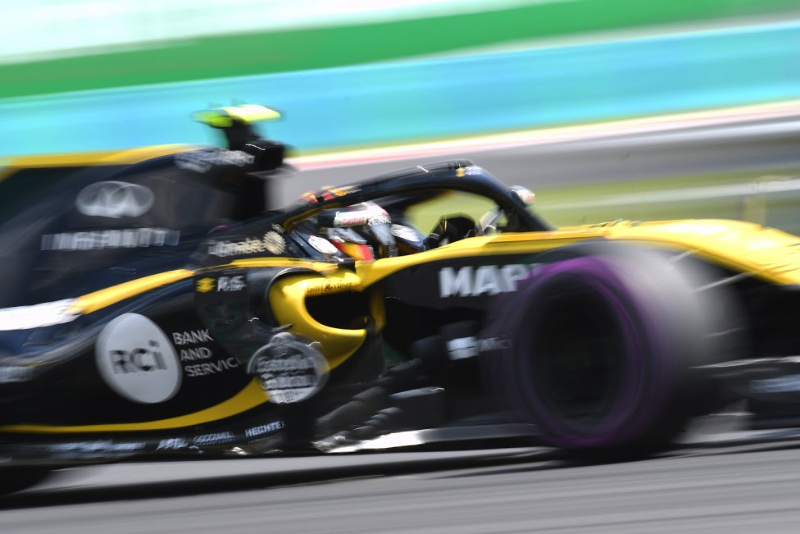 After navigating safely through Q1, Daniel unfortunately had to abandon his lap on the Intermediate tyres following Stroll's spin, thereafter conditions worsened, necessitating extreme tyres and he could not improve on his lap time, eliminating him from Q3. Max initially looked strong in Q3 but as the rain again increased, track conditions and visibility worsened and the grip wasn't there for him to challenge the leading times. P7 and P12 are not where we would hope to start tomorrow's grand prix, however in dry conditions our race pace has looked competitive through the weekend, so we hope we can take advantage and progress through the field. As we saw today the weather can change quickly here too so it could yet be a very interesting race." Esteban Ocon (18th, 1:19.142): "It's disappointing to be out in Q1, but we had an issue with the brakes that held us back. I pitted for slicks when the track was improving and my brake pedal went long. We tried to optimise the situation as much as we could, cooling down the brakes, but that meant I couldn't drive the car at 100%. We definitely had much more than this in the tank. The weather out there was very tricky and we could have taken advantage of the conditions because normally we are really strong in the wet. Given all that happened, though, I am happy not to be last on the grid. We can come back tomorrow and we will push hard to make it back into the points." Sergio Perez (19th, 1:19.200): "A disappointing session. We were expecting more rain towards the end of Q1 so we went out early to set our times and took the best out of the tyres. This really hurt us because the track was improving massively towards the end of Q1 and we didn't complete our best lap when the track was at its best. Sometimes this happens when the weather is changing quickly, but we definitely had much more potential today. For tomorrow I think it's a big challenge to recover if we have a normal race, but you never know what can happen and we never give up." Otmar Szafnauer, Chief Operating Officer: "A very tricky qualifying session, which didn't really go to plan. A brake problem held back Esteban and seriously compromised his qualifying session, especially towards the end when the track was improving. It wasn't easy to call the weather conditions in Q1 and the heavy rain that was forecast didn't arrive as early as we expected. Ultimately Checo didn't set his times when the track was at its best and that's why he dropped out in Q1 as well. It's one we will need to learn from and hope we can recover tomorrow to come away with some points." Lance Stroll (15th, No Time): "I had a good Q1 and got through to Q2, which was very nice. I think we took advantage of the mixed conditions and that was positive. Unfortunately pushing in the wet I just lost the car and that was it. In the rain that is how it goes, you are pushing and looking for grip and sometimes it bites back. It was just unfortunate it was there at turn 10 as there was a wall on the inside, or it could have just been a spin and I could have kept going. Hopefully we can do something in the race tomorrow." Sergey Sirotkin (20th, 1:19.301): "I'm very disappointed with qualifying. With the rain today, it was a big possibility for us and I was looking forward to it as it could have been our best qualifying of the year. In such unpredictable conditions, it's very difficult to guess which lap is going to count. Every time I went out we decided to push on the first lap, which was good, but in doing so I would catch the car ahead of me so I would have to back off on the following lap. This happened to me three times on my three sets of tyres and unfortunately each time the rain stopped and I was not on my quick lap when the track was drier. It's impossible to predict that's going to happen, so we were a bit unlucky which I'm very sorry about." Paddy Lowe, Chief Technical Officer: "It was a very tricky session for everyone. We went out on the intermediate tyre with both cars very early, and it quickly became clear that the slick tyre was coming through, so we went out along with the pack on two new sets of ultrasofts. Having set a few laps, we decided to stop for another set which nobody else did at that moment, and we gained a big profit after Lance set a quick enough lap to get him into Q2. Unfortunately, Sergey had the worse side of traffic at that time and didn't manage to put the lap together for promotion to Q2. In Q2, we went out on the dry tyre and it was the other way around. It became too wet so we pitted Lance for the intermediate for what was actually the only lap which was going to count as the rain fell heavier. Unfortunately, Lance spun off at turn 10 and damaged his front wing, so we kept the car in the garage on his return as no one else was improving. It's a good grid position for Lance, with great driving to achieve that. It was unfortunate for Sergey because I think the car showed more promise this weekend than his grid position would indicate. Let's see what we can do tomorrow." Carlos Sainz (5th, 1:36.743): "What an intense qualifying! I'm really happy with today's performance and it is great when things come together! Only having the Mercedes and the Ferraris in front is a very good sign of how well we managed these conditions. We took a bit of a gamble staying out with the same set of tyres in Q3. This meant I was able to post a very strong time even if the tyre performance wasn't there to improve with my final lap. I was really happy when I saw P3 on the board, and P5 at the end of the session is a pretty good feeling too. Points however are given out tomorrow. Tyre strategy and the start will be specially important but I'm confident we can have a strong race." Nico Hulkenberg (13th, 1:36.506): "There was an issue with the fuel bowser which meant we didn't have enough fuel in the car at the start of Q2, so we lost time when the track was at its best. Once it started raining hard it was pretty much game-over although we gave it a go with the Wet tyres, sadly to no avail. Timing is crucial in conditions like today so it's a shame to have a small technical problem in the garage. It is hard to overtake here, but we have a strong car so I'm hopeful for a good race. A wet race would spice things up, but I'm approaching tomorrow open-minded; I want to make up places and score points." Alan Permane, Sporting Director: "Sessions like today's are never easy. The team and Carlos did a great job in a very challenging Q3 where Carlos drove extremely well for our best qualifying performance to date. Unfortunately, there was a problem with the fuel bowser on Nico's car at the start of Q2 which meant he couldn't get a lap in when the track was at its driest. He tried with the Wet tyres, but the track was simply too wet to be able to go faster later in the session. Everyone has a free starting tyre choice so it opens up the options. The weather forecast does predict a dry race but there's still a chance of the heavens opening again so there's potential for an eventful race. We'll be looking to maximise every opportunity." Pierre Gasly (6th, 1:37.591): "It was a crazy qualifying for us, especially in these conditions but I'm super happy with the outcome! It was very tricky to keep the car on track, but the team made a fantastic strategy with the tyres and I managed to put a good lap in. It was super difficult but I really enjoyed it! When I saw the rain coming before Qualifying I thought there could be an opportunity, and the result of P6 is just incredible, especially after the tough few weekends we've had, it's really an unbelievable result for the team. To get both cars into Q3 was a great job and it's a mega day for Toro Rosso. It's really important to have a good Qualifying here as it is hard to overtake and in the race we'll give the others around us a hard time! I think we have good pace so we need to stay focussed and prepare well for tomorrow." Brendon Hartley (8th, 1:38.128): "The conditions were really tricky out there, but I'm incredibly happy to make it into Q3 for the first time! I had a couple of little mistakes at the end of Q3 when I started pushing the limits and I fell just short of Pierre's time, which put us in P8. The whole way through Qualifying the team did a brilliant job with communication and strategy and the car felt good. I think we're always hanging around the top 10, and to get both cars through today is a really big achievement. It's quite hard to pass here so I need to have the best possible start and a good first lap. There might be some strategy in play as it's a little bit of follow the leader around here, so hopefully we can hang on to a points position tomorrow." Jonathan Eddolls, Chief Race Engineer: "It has been a fantastic afternoon for the whole team, and I want to thank everyone here and in the factories in Faenza, Bicester, Milton Keynes and Sakura for all their support in making this result possible! Coming to this race, we knew the qualifying session here in Hungary would offer potential for a good result with the characteristics of our car, but we didn't imagine we would be lining up in P6 and P8 on Sunday! During FP3, we continued working on optimising the dry qualifying balance and we came out of the session very happy with where we were. Even if we didn't get the cleanest laps we were still competitive, so we were confident heading into a dry Qualifying we would get at least one car into Q3. However, just before the session, the heavens opened, which at the time we were quite disappointed about as we were hoping for a smooth session with good performance. However, in the end it actually worked in our favour and the whole team did an amazing job – the communication was clear and concise, we made the correct decisions on tyres and we all worked extremely well together. It's really in tricky days like today where teamwork and communication make all of the difference. Both our drivers have little experience in Formula 1 in these conditions but they were able to extract the maximum from the car. In Q3 there was only one lap that was going to count: the last one. And both drivers gave it their all. We held the cars in the pit stops with the aim of crossing the line right at the end of the session and this worked well too. It was extremely busy in the garage with multiple sets of Wets, Inters and Dry tyres for both cars but the mechanics did a fantastic job to carry out the stops faultlessly. Thanks to them for their great work! Looking ahead to tomorrow, our forecast is predicting dry weather and our long run pace on Friday was fairly competitive. The track will reset with this rain but we are still expecting hot conditions so it's going to make for an interesting race and our aim is to score good points." Toyoharu Tanabe, Honda F1 Technical Director: "It was an excellent qualifying for us being able to carry forward the momentum we had yesterday, going on to secure sixth and eighth places on the grid at the end of a tough session. The team and drivers did a brilliant job and on the PU side, we got the energy management right in the frequently changing conditions, which were very tricky for everyone. We showed a good pace in the morning practice in the dry and I'm looking forward to seeing how we do in the race, especially as overtaking is so difficult here." Kevin Magnussen (9th, 1:39.856): "I'm not disappointed with P9 and P10. We had hoped for a little bit more, in dry conditions at least, but in those tricky conditions the team did a very good job to stay calm, put us on the right tires, and send us out at the right time. It's so easy to make the wrong decision in those conditions, and there's a lot of pressure on the team in that situation. In the dry, they send us out and we have to do the job. But in the wet, it's really down to them and they did the right thing. So, good job to them." Romain Grosjean (10th, 1:40.593): "I'm happy with my job today, but I'm disappointed with the result in Q3. I was blocked by Max (Verstappen) in the last corner of the second to last lap and started just in his spray and couldn't see anything in the last lap, so a bit disappointed with that. I think we were very, very fast on dries. I think at one point I was P1 and then P2. The car was up there, but then it rained and it was a challenge to get into Q3, which we did and that's great. There's some work to be done on the car in the wet. We haven't been very competitive, but I think this is the first time we've driven the Haas VF-18 in those conditions, so there is a lot that we can learn from it and that's positive. Obviously, everything is open for the race tomorrow. All in all, not a bad session." Guenther Steiner, Team Principal: "Quite an exciting qualifying. Again having two cars in Q3 is fantastic for us. So, all in all a positive day today." Fernando Alonso (11th, 1:35.214): "The conditions were very difficult today and in these situations you need to have a bit of luck and be on track at the right time. We haven't been very competitive this weekend and in Q1 we were already a bit concerned that we wouldn't make it through to Q2. Thanks to the rain we managed to get to P11, which is a good place, close to the points zone. Starting positions here are quite important and we are probably further up than we thought we would be. At the end of Q2 the heavy rain was affecting the last part of the track, so we decided to attempt another run on extreme Wet tyres, knowing that we would probably be slower, but we tried anyway." Stoffel Vandoorne (16th, 1:18.782): "It was quite tricky out there today – especially at the start of qualifying – to know what tyre to be on and make the right call about slick tyres, because the track was still quite hot from the sun during the day. Every time we crossed the line on a timed lap we were competitive, in the top 10 on both the Intermediates and on the slicks as well. It was all about being on track at the right time, and we were just a bit out of sequence as we had to box the car about one minute before the end of Q1 so we didn't get that final lap, right when the track was at its driest. That just wasn't enough to get through to Q2. It's always a bit of a gamble in these conditions, as it can play out to be good or bad. It's unfortunate, but these things happen. We tried hard." Gil de Ferran, Sporting Director: "Today's conditions provided us with a bit of a lottery with regards to traffic management, tyre choice and run plan, particularly during Q1 and Q2. The weather was very unstable and therefore a lot of the qualifying positions are unrepresentative, which quite frankly could make for a very interesting and exciting race tomorrow. We got a little bit unlucky with Stoffel this afternoon. Nevertheless, on Fernando's side our qualifying was a bit more reflective of our real pace. We're in a good position to fight for points tomorrow and I would welcome some more changeable weather to give the fans a good show at the Hungarian Grand Prix." Marcus Ericsson (14th, 1:37.075): "It was a very difficult qualifying with the weather conditions playing a very big part in it. Conditions were tricky and reminded me a lot of Hockenheim, but I felt really comfortable. It was nice to go into Q2 – it was very close though. In Q2 I had the yellow flag when the track was at its best. I tried to improve but there was too much water on the track. It's still a good result. P14 is a decent place to start from and we will see what we can do from there." Charles Leclerc (17th, 1:18.817): "It was not a good day for me. Qualifying was tricky as it started raining lightly just before the session started. We went out on intermediate tyres, however, the track was too dry to put in good lap times. After we changed to ultrasoft tyres, we got back in the mix, but all of the teams were advancing quickly and positions were changing within seconds. At the end, it was not enough today. I hope that the race tomorrow will be an interesting one, and that we will be able to make some progress."